The ZigZag1 Screen System allows for a completely unobstructed view, with no vertical profiles and can be retracted neatly out of the way when not in use. A great option for larger openings, such as Bi-folding or Lift and Slide Doors and large panoramic openings. The Screen can be opened from either end and can be positioned wherever needed. 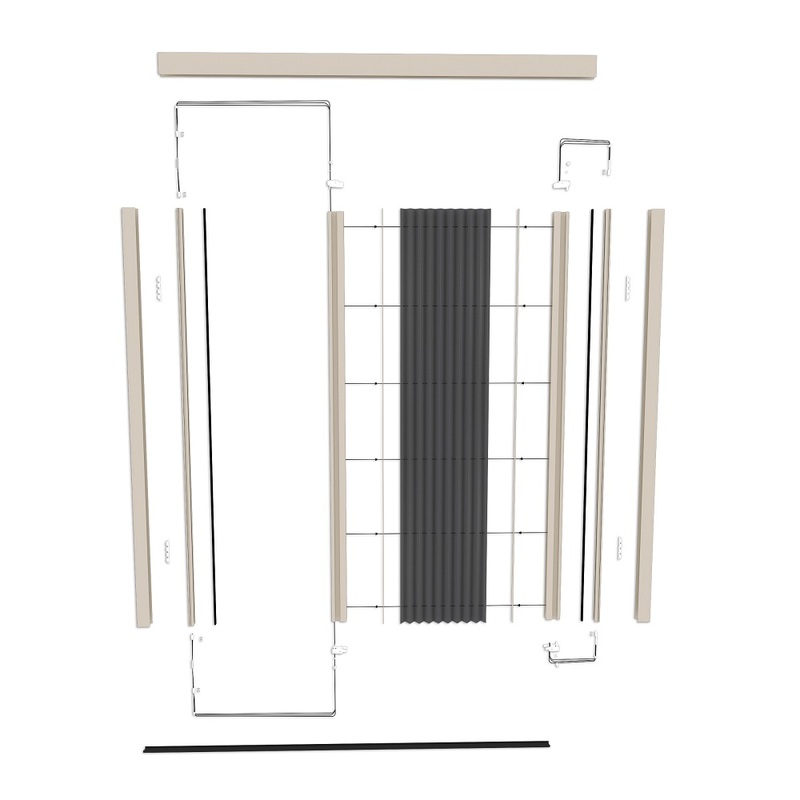 Please Note: When ordering the ZigZag1 Retractable Screens, select the Frame Color Option, Installation Option, Opening Dimensions and then select the ZigZag1 Screen System from the Drop Down Menu Below that matches the opening width and height dimensions where the screens will be installed. As there are many different opening sizes available for this screen system, this menu is very large. Opening Width *: 24" 25" 26" 27" 28" 29" 30" 31" 32" 33" 34" 35" 36" 37" 38" 39" 40" 41" 42" 43" 44" 45" 46" 47" 48" 49" 50" 51" 52" 53" 54" 55" 56" 57" 58" 59" 60" 61" 62" 63" 64" 65" 66" 67" 68" 69" 70" 71" 72" 73" 74" 75" 76" 77" 78" 79" 80" 81" 82" 83" 84" 85" 86" 87" 88" 89" 90" 91" 92" 93" 94" 95" 96" 97" 98" 99" 100" 101" 102" 103" 104" 105" 106" 107" 108" 109" 110" 111" 112" 113" 114" 115" 116" 117" 118" 119" 120" 121" 122" 123" 124" 125" 126" 127" 128" 129" 130" 131" 132" 133" 134" 135" 136" 137" 138" 139" 140" 141" 142" 143" 144" 145" 146" 147" 148" 149" 150" 151" 152" 153" 154" 155" 156" 157" 158" 159" 160" 161" 162" 163" 164" 165" 166" 167" 168" 169" 170" 171" 172" 173" 174" 175" 176" 177" 178" 179" 180" 181" 182" 183" 184" 185" 186" 187" 188" 189" 190" 191" 192" 193" 194" 195" 196" 197" 198"
Opening Height *: 24" 25" 26" 27" 28" 29" 30" 31" 32" 33" 34" 35" 36" 37" 38" 39" 40" 41" 42" 43" 44" 45" 46" 47" 48" 49" 50" 51" 52" 53" 54" 55" 56" 57" 58" 59" 60" 61" 62" 63" 64" 65" 66" 67" 68" 69" 70" 71" 72" 73" 74" 75" 76" 77" 78" 79" 80" 81" 82" 83" 84" 85" 86" 87" 88" 89" 90" 91" 92" 93" 94" 95" 96" 97" 98" 99" 100" 101" 102" 103" 104" 105" 106" 107" 108" 109" 110" 111" 112" 113" 114" 115" 116" 117" 118" 119" 120" 121" 122" 123" 124" 125" 126"
This screen is not intended to be left open and exposed continually to wind, sun, rain or other harsh conditions. When the screen is not being actively used to protect people or when it is windy, then it should be retracted. Wind can change the alignment of the screen so always make sure that the edges of the screen fabric are riding completely inside the guide rails before retracting the screen.